By Y. Marianov | Rev. Moon | Values | Prophecies .. Recently even Archbishop George Augustus Stallings Jr. proclaimed Rev. Moon as The Messiah. He and Rabbi Mordecai Waldman are only few of the hundreds of world know religious and political leaders testifying of Rev. Moon as the Messiah. As the founder of the Unification Church, Rev. 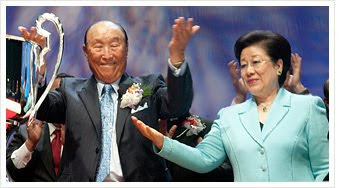 Sun Myung Moon has started a new world religion with its roots in Korea, and is a spiritual leader who has the respect of the entire world as a result of his efforts to build world peace. Born in 1920 in Jeongju , South Pyeongan Province, he received a revelation from Jesus on Easter morning when he was 16 years old, calling him to work for the salvation of mankind, after which he earnestly sought God's guidance in prayer and meditation. John Hogue, in researching and interpreting these sixty or so quatrains that pertain to this incredible man who will usher in this new millennium of peace. He names Rev. Sun Myung Moon as one of the ten candidates in his grid. He goes through the eight clues that Nostradamus gives as to who the Messiah might be. Presently only Rev. Moon is still alive, so he is the only one fulfilling all prophesies exactly. 2. Moon is the only person who fulfils the prophecy of Nostradamus, that "He will unite religions against the Red (Communism)"
Reverend Moon founder of Unificationism, unites Christians, Muslims and Jews through inter-religious dialogue and reconciliation. The Middle East Peace Initiative of the Universal Peace Federation is rooted in the theological and philosophy of peace of Rev Sun Myung Moon. It brings effort for peace working together "Heart to Heart". 4. Moon is definitely the only person who Blesses many families wherever he goes, as Nostradamus predicted. 400 million couples had already received his Blessings. Is Rev. Sun Myung Moon the Messiah?